A trip from Johannesburg to the Kruger National Park through the Mpumalanga Drakensberg region reveals to you the scenic beauty of South Africa at a handlebar level. When you’re exploring this country, there are few things better than stopping at a viewpoint and being rewarded with the kind of scenery that brightens your day and broadens your horizons. On the Panorama Route in Mpumalanga, every viewpoint gives you that opportunity. Breathtaking views, plunging waterfalls, eagles flying above you and a rich history, are the kinds of things that will inspire you when you ride along the Panorama Route. Guarded by the small town of Graskop, this famous route is home to mountains, forests and canyons, most notably, the Blyde River Canyon which is also world’s largest ‘green canyon’. You'll find more than 1 000 species of flora in the reserve, including several species of endangered cycads, and, in spring, carpets of wild flowers. Bird and animal life is certainly abundant in this region. The awe-inspiring falls are just a ride away as are scenic landmarks such as the Three Rondavels and God’s Window, where you can walk in the thick, indigenous mist forest that stands amongst the clouds above Blyde River Canyon. 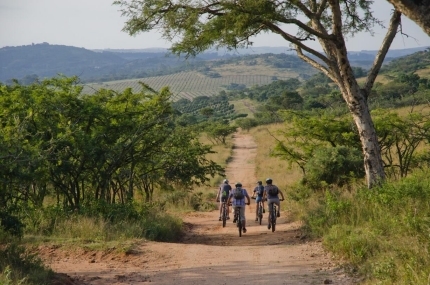 Combining this with a traditional safari in Kruger National Park, seeing the Big Five and more, makes this an exceptional cycling adventure.